HARRISBURG, Pa. -- The agency that investigates and prosecutes wrongdoing by Pennsylvania lawyers wants the state Supreme Court to punish Penn State's former general counsel and a prosecutor who helped convict Jerry Sandusky of child molestation related to their involvement with the 2012 grand jury investigation. The state Office of Disciplinary Counsel has lodged petitions for discipline against Cynthia Baldwin, a former state Supreme Court justice who was the university's general counsel when the scandal broke, and Frank Fina, who helped direct the investigation and lead the prosecution of Sandusky by the attorney general's office. The allegations against the two recently became public. Baldwin has a hearing scheduled for May. Fina is accused of turning Baldwin "into a witness for the prosecution" when Baldwin testified in secret in October 2012 about three former high-ranking university administrators who fielded complaints about Sandusky abusing children - president Graham Spanier, vice president Gary Schultz and athletic director Tim Curley. Disciplinary Counsel Amelia C. Kittredge wrote in the 41-page petition for discipline filed in January that Fina's questioning "went far beyond, and impermissibly beyond, the topics (he) told Judge (Barry) Feudale he would cover." Days after Baldwin's testimony, prosecutors added conspiracy to commit perjury and conspiracy to commit obstruction charges against Curley and Schultz and for the first time charged Spanier, accusing him of the same offenses. Superior Court in January 2016 threw out charges against all three men that related to false statements to the grand jury, saying Fina had misled the judge and calling his questioning of Baldwin "highly improper." Fina's lawyers call the claims against their client "unprecedented and disturbing," and said sealed records from the criminal case "fully exonerate" him. Fina, now a lawyer in private practice, denies violating any rule of conduct and wants the petition dismissed. Curley and Schultz pleaded guilty to misdemeanor child endangerment on the eve of trial in March 2017 and testified against Spanier. Spanier was convicted of the same offense and has an appeal pending in Superior Court. Lawyers for all three men declined to comment on the lawyer discipline allegations against Fina and Baldwin. Superior Court, in throwing out charges, said it was improper that Baldwin, a former trial judge and onetime chair of the Penn State board, testified about her conversations with Curley, Schultz and Spanier. Joe Grace, a spokesman for the attorney general's office, said it questioned Baldwin "with the knowledge and approval of the judge assigned to supervise the grand jury." "The matter was also addressed by the judge assigned to the criminal case, who rejected any claims of impropriety," he added. "The Office of Attorney General remains fully prepared to defend its successful prosecutions and convictions in this matter." The petition filed against Baldwin on Nov. 21 accuses her of violating requirements that lawyers do not disclose information about clients without their informed consent and other allegations. Baldwin had accompanied Curley, Schultz and Spanier when they appeared before the grand jury in 2011, months before child sexual abuse charges were filed against Sandusky and cover-up charges were filed against Curley and Schultz. In her answer to the petition for discipline, she said she thought they were witnesses only, not suspected of a crime, and that she represented the university. She denies violating the state's ethical rules for lawyers and has asked that the allegations be dismissed. "The allegations against Ms. Baldwin are based upon the conduct of Mr. Curley, Mr. Schultz and Dr. Spanier, who participated in a conspiracy to cover up their knowledge of Mr. Sandusky's conduct and who tried to blame Ms. Baldwin when their conspiracy came to light," wrote her lawyer, Robert S. Tintner. He said the original complaint about her to the Disciplinary Board of the Supreme Court was filed in June 2012, at the time of Sandusky's trial. Tintner said the sealed documents show she "acted in a manner consistent with her ethical obligations." 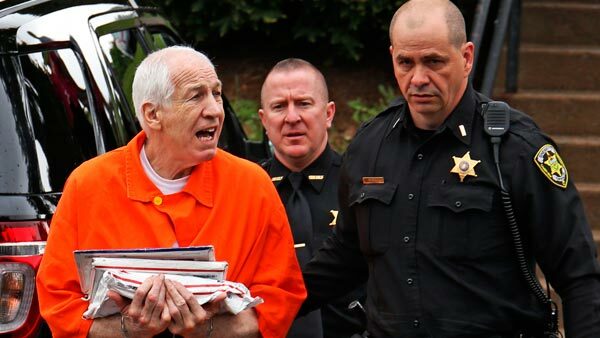 Sandusky, Penn State's former assistant football coach, was convicted in 2012 of sexually abusing 10 boys and is serving a 30- to 60-year prison sentence. Al Lindsay, Sandusky's appellate defense attorney said the disciplinary board cases will not directly affect Sandusky's effort to get a new trial, but Lindsay believes the grand jury investigation was badly flawed and welcomes any effort to review how it unfolded.